That not exactly how I remember the demise of our Argos fanaticism. I seem to recall that the instant the Jays became official we got seasons tickets, canceled the Argos ones and that was pretty much that. But we really should’ve gone to the CFL Eastern final playoff game this year! I’m older than you, and I’m pretty sure we held onto the Argos tickets for the first few seasons along with the Jays tickets. 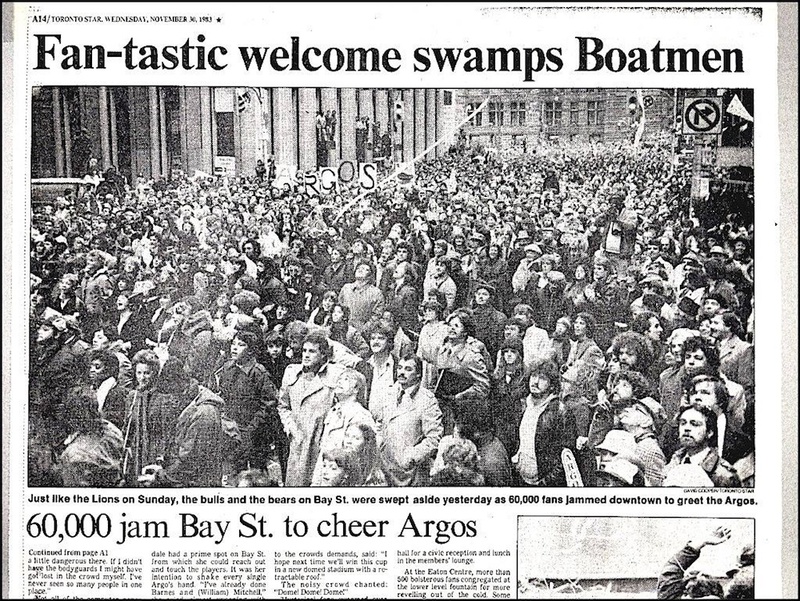 I went with some friends, as a teen, to Bay St. to watch the Calgary team and fans congregate the night before the game. I think Hamilton was the East (Big Four) opponent. The fans were juiced up. One guy offered to sell us his wife for the night in exchange for $20 for some beer. Both were high. She looked Barry and I over and laughed and said, “Why not?” We didn’t have $20 and were scared stiff. Calgary lost too! 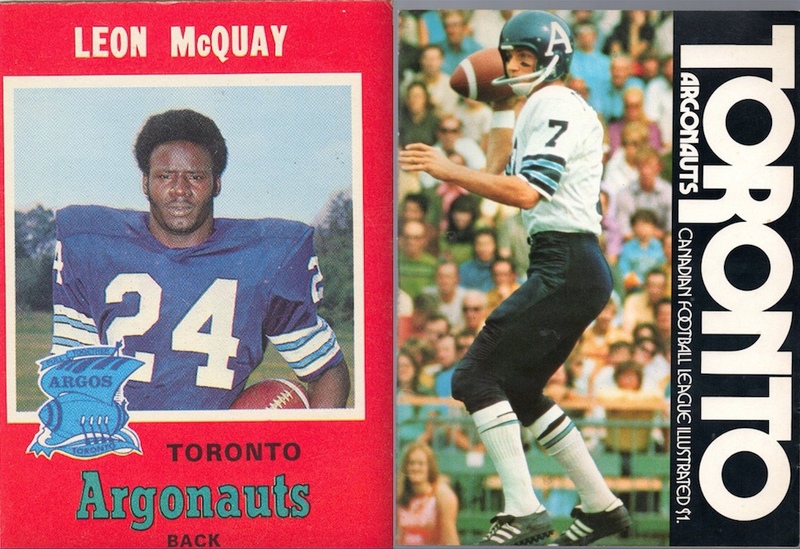 I remember Balmy Beach playing U of T for the right to play Argos the winner to play the West. Before the Lions existed. I remember leather helmets and canvass pants for players. Cheerleaders who weren’t Sunshine Girls in skimpy attire and actually watch the game not the hunks in nylon pants! Man could he & Jerry connect!! Poetry in motion. After Joe retired I became a Pittsburgh Steeler fan (shades of Steel city right?) Loved Kordell Stewart as Q. When he left & Big Ben was brought in I lost my enthusiasm for the team. 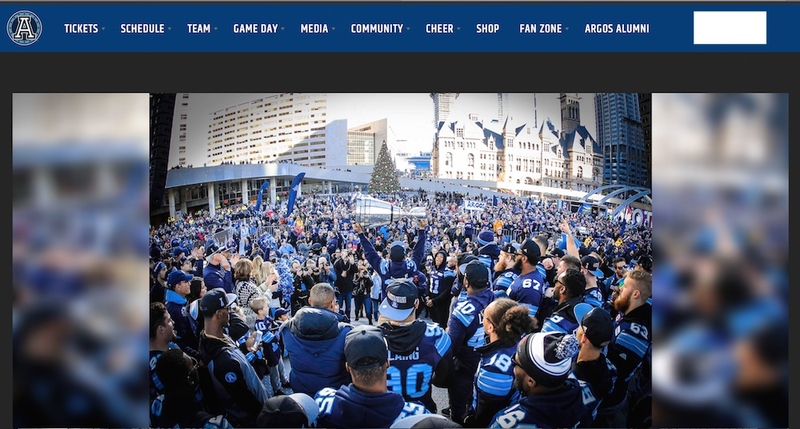 Now I’m a ‘free agent’ cheering for almost every team…..
Great ‘Argos and Me’ sojourn! Reflective of the ‘in love’-‘out of love’, ‘in love’-‘out of love’ lifetime sagas between many CFL, ‘BIG FOUR FOOTBALL’ fans/supporters going on seventy years. Many of the mercurial ups and downs have mirrored ‘good-bad’…’bad-good’ ownership and stadiums of all four ‘original’ Eastern teams with the additional factors of Major League Baseball tossed into the mix for both the Montreal and Toronto teams. Your journey with ‘your Argos’ eerily resembles mine with ‘my’ Alouettes!